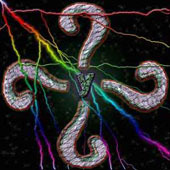 Planting themselves firmly in the art/experimental metal ring with their self-financed, self-produced debut y, Qwestion delivers nearly an hour of twisting, complex music. John Hall delivers crunchy riffs throughout the album, creating some great guitar-driven ethereal moments. Though the album sounds more like an open jam session between John and bass player (slash producer, manager, art designer, etc.) Mike Griffith, the abundant use of effects and complex off-time drumming works to make y come together as a very interesting prog-metal journey. "Chaos Theory" sticks out as a great track mainly because of the heavy riffs laid down by John. The name of the tune is quite appropriate when taking into consideration the intricate drumming (programmed on this album, I believe, since the CD booklet refers to their drummer being TBD). "Freeprov" makes use of the turntable talents of one Jimmy Rad, mixing trip-hop and rap elements into the Zappa-inspired experimentation. One thing noticeably absent from y are vocals of any sort. There are some samples in the aforementioned "Freeprov", and some dude singing a capella while showering, but those hardly qualify as vocals. Honestly, I don't think that the introduction of a singer would benefit the music at all, and in fact could detract from the free ride enjoyed by both musicians. Being a bass player myself, I'm drawn to the sixth track "Muse". This song has Mike going at it solo backed by some awesome otherworldly effects. A perfect tune to chill to, and my personal favorite on the album. The album y is a quality example of technical metal experimentation, but it's because of this that it will turn off the average metalhead. For those who like their metal complex more so than melodic or harsh, Qwestion delivers.